The state Seaport Advisory Council has approved a $1.3 million grant to move Lynn's stalled commuter ferry project forward. "This brings us a step closer to having a commuter ferry in Lynn," James Cowdell, executive director of the Lynn Economic Development and Industrial Corp. (EDIC), said Tuesday. The grant, slated to be awarded to the EDIC in July 2011, will be applied to Phase II of the ferry project, which relates to reconstruction of a stone bulkhead adjacent to the Blossom Street public boat ramp. Cowdell said a previous grant to Lynn from the Seaport Advisory Council for $750,000 paid for Phase I - demolition of a building on the site of the proposed ferry terminal, construction of a public boat ramp and the paving of parking spaces. "That grant was approved in 2007 and we got the money in July 2008," he said. 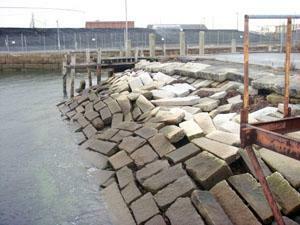 The stone bulkhead, which sits adjacent to the Blossom Street public boat ramp in Lynn, is slated for improvements. State Sen. Thomas McGee said the ferry project, once completed, will expand waterfront accessibility for the community. "I'm pleased to see that Phase II of the Blossom Street Ferry Project has been approved. Moving forward with this project will improve the infrastructure conditions, enhance economic development, and expand waterfront accessibility to the community," said McGee said. "This project is an incredibly important part in expanding the future economic revitalization of the waterfront." The grant to Lynn was among 13 voted on at the council's meeting in Fairhaven last week, where Lt. Gov. Timothy Murray, the council chairman, introduced several projects aimed at boosting port city industries such as commercial fishing, recreational boating and tourism. Funding for the council-sanctioned projects is supported by the Energy and Environmental Bond Bill, which the Legislature approved and Gov. Deval Patrick authorized in 2008. McGee said the bulkhead will increase from 60 feet to 150 feet and complement approximately 2.7 acres of oceanfront land owned by the EDIC in Lynn. The overall project aims to make the facility a seasonal and, eventually, a year-round ferry terminal, he said. City officials learned in January that the $8.4 million in anticipated American Recovery and Reinvestment Act (ARRA) funds for the Lynn ferry terminal would not be awarded. The Federal Transit Administration found fault with the plan and determined it should not receive ARRA funds. Much of the federal agency's criticism was focused on the design of the vehicular traffic pattern along the Lynnway that would channel commuters to and from the terminal, as well as the cost of a ferry ticket and a forecast of low ridership. "Any improvements to our infrastructure - in this case a seawall - are welcome, especially if they are not coming out of the city budget," said Mayor Judith Flanagan Kennedy.